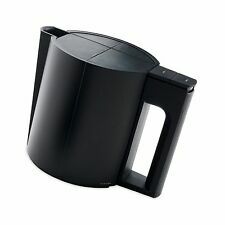 JACOB JENSEN ELEC KETTLE 1.2L BLACK. you can buy in set of 6 max. we do not take any responsibilty after this. Ending Soon. New Arrivals. QUICK LINKS. Monitor & TV. Desktop PC. 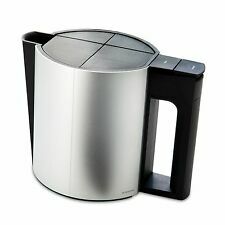 Cordless electric kettle in sandblasted aluminium with several features: Wall mounting set included, 360??. Housing material: Aluminium. Colour of product: Aluminium. Water tank capacity: 1.2 L. Adjustable thermostat: No. Cordless electric kettle in sandblasted aluminium with several features: Wall mounting set included, 360??. 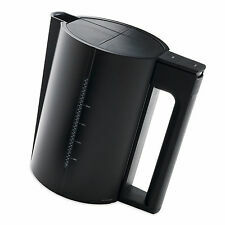 Water tank capacity: 1.2 L. Colour of product: Black. CD & DVD Drives. Housing material: Aluminium. JACOB JENSEN JBXK12 electric kettle 1.2 L Aluminium 2200 W. 1.2 L, aluminium, 1.2 kg. Product colour Aluminium. Housing material Aluminium. Water tank capacity 1.2 L. It speeds things up if you can write your RMA number clearly on the outside of your parcel. Der Jacob Jensen Electric Kettle ist ein absolut formschöner leicht zu handhabender drahtloser Wasserkocher. Der Wasserkocher in Aktion. Per Knopfdruck öffnet sich der Deckel in einer magisch fließenden Bewegung.